Born in Texas in 1925, influential Pop Artist Robert Rauschenberg first had aspirations of becoming a pharmacist. While serving in the U.S. Marine Corps during WWII, he discovered his artistic capabilities and went to study at the Kansas City Art Institute after completing his military service. In 1948 Rauschenberg enrolled at the Académie Julian in Paris, and later that year he returned to the U.S. to attend Black Mountain College, North Carolina. It was at Black Mountain that he collaborated with the influential avant-garde composer John Cage and choreographer Merce Cunningham. In 1949 Rauschenberg moved to New York City where he further established himself as an important artist of the time. 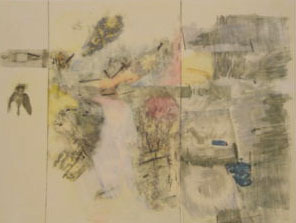 Rauschenberg was most influential in his use of materials and his appropriation of images and objects from pop culture. He combined fine art practices such as painting and sculpture with objects of everyday life. From these three-dimensional "Combines," he moved to creating two-dimensional collages. As a comment on mass culture, these collages consisted of familiar images from newspapers and magazines, which, he would incorporate into his work by making them into screen prints. On view in The Dean's Gallery are Rauschenberg's 34 illustrations for Dante's Inferno. As Calvin Tomkins said in his book Off the Wall: Rauschenberg and the Art World of our Time (1980), the idea of illustrating Inferno was born in 1959 through Rauschenberg's desire to be taken more seriously as an artist. He was also inspired by the subject and thought it would be a powerful topic to explore artistically. Rauschenberg produced one drawing for each of the cantos, representing the characters with photographs taken from magazines and newspapers. He used images of politicians, including John Kennedy, Richard Nixon, and Adlai Stevenson, and other public figures such as athletes, astronauts, racecar drivers, and police. To create these collages, he would use a solvent to adhere the images to his drawing surface, then overlay them with a variety of media, including pen, gouache (an opaque watercolor), and pencil. The portfolio of lithographs seen here are based upon the original drawings. These prints are from the collection of the MIT List Visual Arts Center, and were a gift from Dr. and Mrs. Joseph I. Singer. After this exhibition, they are expected to be installed in the new Brain and Cognitive Sciences building. All images are protected by copyright law and thus cannot be reproduced or altered without the expressed, written permission of the artists.